NETWORK FINALS: SUNDAY NIGHT FOOTBALL adjusted to 5.8, steady with last week’s game. CABLE HIGHLIGHTS: There was no new RICK & MORTY, clearing the way for AMC’s FEAR THE WALKING DEAD to lead scripted cable on Sunday, even though it dropped 0.11 to 0.77, with TALKING DAED down 0.02 to 0.30. In place of RICK & MORTY, Adult Swim had ROBOT CHICKEN, at exactly one-third the rating with 0.51. On HBO, LAST WEEK TONIGHT was steady at 0.43, CURB YOUR ENTHUSIASM dropped 0.13 from last week’s premiere to 0.39, THE DEUCE held at 0.27, and VICE PRINCIPALS was down 0.08 to 0.26. Starz’s OUTLANDER ticked up to 0.34, and SURVIVOR’S REMORSE was listed by Starz as a rerun, although at 0.10/279K (down 0.06 from last week), it may have been new. On Showtime, RAY DONOVAN was steady at 0.28, the series finale of EPISODES ticked up to 0.07, and the season (?) finale of DICE held at 0.03/115K. 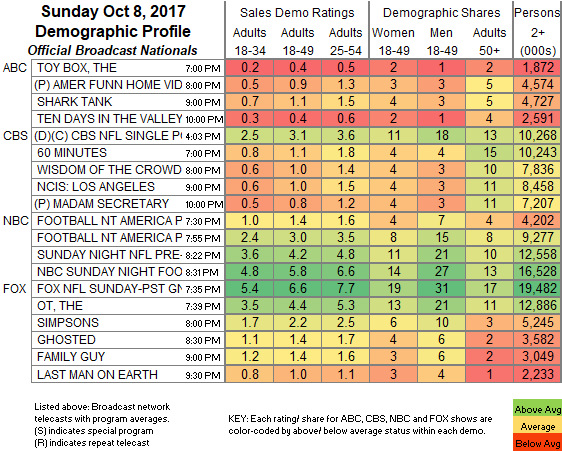 The 2-episode season finale of TNT’s THE LAST SHIP was at 0.30/0.25, compared to last week’s 0.28. The season finale of Hallmark’s CHESAPEAKE SHORES fell 0.06 to 0.20. Unscripted cable was dominated by Fox Sports 1’s MLB PLAYOFFS game at 1.41, with the afternoon game at 0.52. On E!, KEEPING UP THE KARDASHIANS dropped 0.05 to 0.65, and WAGS was down 0.07 to 0.23, with an 11PM episode at 0.16. 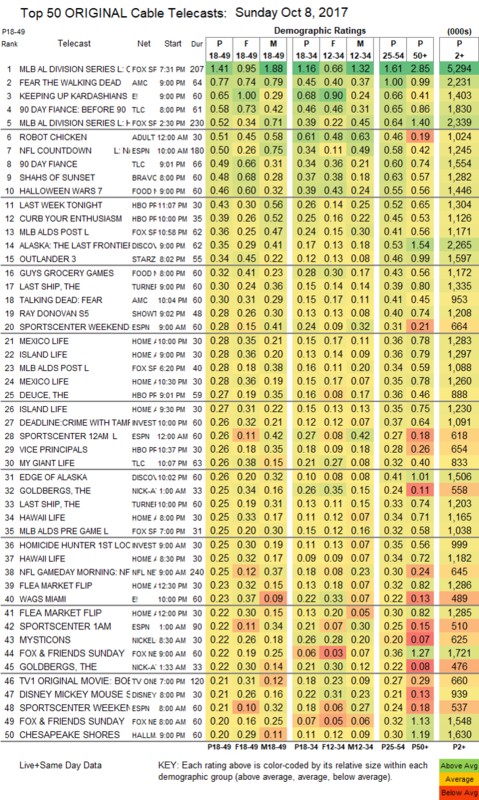 On TLC, 90 DAY FIANCE was at 0.58/0.49 compared to last week’s 0.60/0.30, and MY GIANT LIFE grew 0.04 to 0.26. Bravo’s SHAHS OF SUNSET ticked down to 0.48. On Food Network, HALLOWEEN WARS was down 0.02 to 0.46, and GUY’S GROCERY GAMES was at 0.32. Discovery’s ALASKA: THE LAST FRONTIER dropped 0.08 to 0.35, and EDGE OF ALASKA was at 0.26. HGTV’s extensive line-up was led by MEXICO LIFE at 0.28/0.28, compared to last week’s 0.27/0.23.